What is grave worship? and what is considered so? I've heard that going to graveyards and performing worship in front of the deads is forbidden, and is called "grave worship". Is that true? What is grave worship? what actions and situations are considered so? and what are the consequences of that? (I heard it makes one mushrik). I am not going to use logic, sweet words or use unrelated verses. Now, what happens in the shrines or at the graves is that people go to the shrines and the graves of the pious people and say for example: O Hussien, Ask allah to forgive our sins. This is considered shirk(Grave worshipper) He is dead. He can't do anything. Not to mention you are basically ignoring the command in the Quran that says you must ask allah directly. Prophet Mohammed said that Dua'a(supplication) is considered worshipping. An-Nu'man bin Bashir (May Allah be pleased with them) reported: The Prophet (PBUH) said, "Du'a (supplication) is worship." And if you read Surah Nuh. You will find the verse that talks about pious people who lived before Nuh. WHen they died. People used to visit their graves and ask them to do things only Allah can do. Because of these people who made the pious people as gods. Allah sent Nuh to them so that he can bring them back to the correct path of worshiping only allah. Now, Are we allowed to pray inside a mosque that was built over a grave ? Narrated Sa'id: and the narrator Musa said: As far as Amr thinks, the Prophet (peace_be_upon_him) said: The whole earth is a place of prayer except public baths and graveyards. This is clearly grave worshiping and is considered haram. Another wrong thing muslims do, Is that they think that reading Quran or making supplication near the grave would make your supplications more acceptable or the deeds of reading Quran would be multiplied. Another wrong thing is that by touching or visitng the grave you would be blessed by allah. Abu Huraira reported: The Messenger of Allah (may peace be upon him) said: Let there be curse of Allah upon the Jews and the Christians for they have taken the graves of their apostles as places of worship. Talking about prostration, Allah (swt) commanded the angels to prostrate before Adam as a sign of sheer respect, not as worship, prostrating in front of something or someone out of respect is acceptable but its better if you don't do it, only if Commanded by Allah (swt). As for grave worshipping, you are prostrating before the dead person and asking him to do things only Allah can do or asking him to act as a sort of medium between the person and Allah, so Allah will grant his Dua's faster or better, that brothers and sisters is utterly Haraam, ask Allah alone and there is nothing like "shirk is allowed" whatsoever as the other brother pointed out Shirk is to associate partners with Allah or putting someone or something in the same rank as Allah That is completely haraam, may Allah guide us all to the right path, and unite the muslims and grant all of us Jannat-ul- Firdous. This is primarily opinion based. Because your question asks that. I've heard that going to graveyards and performing worship in front of the deads is forbidden. You might have heard this from those who're not Sufis. What you heard is true, but in fact is it? Primarily opinion based. Depends upon how you interpret Islam. This is a broad term used by Non Sufis, to describe the people who think that dead people can listen to them. You need not, go to the graves even, you can directly invoke those dead people hoping they can listen to you. 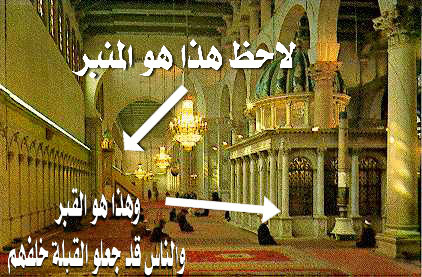 But, there are Hadith which they might use, actual visiting graves is better so that they can listen better. what actions and situations are considered so? By asking if it is forbidden, I think you mean to ask if it is Shirk or not, because Non Sufis simply use the polite term "forbidden". Non Sufis use this list to describe how it is shirk. But, Sufis tell, "Hey in that list, all those verses are referring to deities besides Allah, but we don't consider those dead people deities, but just simply ask them". The "ask them" is considered as "invoking them" by Non Sufis. non Sufis obviously if call that action as Shirk then one who performs it is called "Mushrik". And vice versa. And Consequences of Shirk, I think you know it. From here I just provide my thoughts over this. Going to graveyards is not sin, but going to graveyards with an intention that you'll get extra something from there is a Shirk. Because going to hajj, going to Masjid is different from going to graveyards. These are commanded do be done. But visiting graveyards every now and then to show up is not commanded. Don't get in what way are you asking, a pic could've been better. But, anywhere you go, worshiping Allah maintaining something as "Sutrah" wouldn't make it a problem. But, they don't say you worship a person as you do to Allah. So, they say "asking from the dead as though they're listening to you". Again as I said above, is opinion based unless you specify a view. A Sufi view would be yes, it is permissible, and a Non Sufi view would be a somewhat closer to this question "Permissible to talk to someone in my mind who has died? ", i.e if the dead cannot hear, then asking them would make no use, Unless if the dead is a martyr (Even if he is, there goes another discussion for it). Just comment below if you've changed your mind and want a view specific answer. Not the answer you're looking for? Browse other questions tagged halal-haram shirk death or ask your own question. What are the rulings of visitng graves and graves of pious people? Does pure intention (Niyah) protect from shirk? If someone dies doing something risky is it suicide? Is spinal marrow haram to consume? What kind of games are permissible and forbbiden? Can a person see himself being taken into the grave?